The miserable weather in Northern Italy did not stop the enthusiasm in Milan. Climbing the Passo Turchino Frenchman Henri Pellisier went over first to win the climbing preme (cash prize). After a re-grouping on the decent Vincenzo Borgarello and Ugo Agostoni were breaking away going through Voltri. Lorenzo Saccone and Ezio Corlaita led a hard chasing group. At the San Remo finish on the Corso Cavallotti a very close finishing sprint saw Ugo Agostoni narrowly beat Carlo Galetti for the victory. 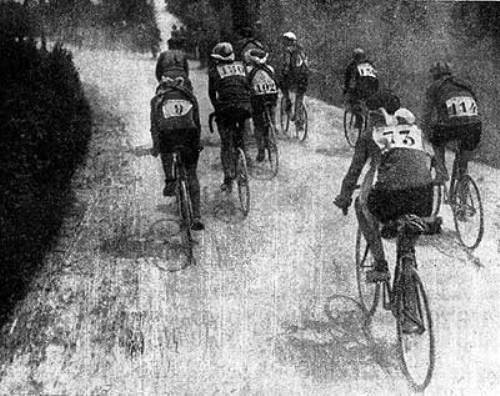 Battling the wind and rain most of the race, Ugo Agostoni became only the second Italian rider to win the prestigious Milan-San Remo, ending a 4 year ‘Italian victory' drought. SPECIAL NOTE: Ugo Agostoni at the age of 20 years and 252 days is the youngest winner Milan-San Remo. 1. Ugo AGOSTONI (Ita) 10h32'32"